How often does Scoops come out? Most of our customers prefer service once a week. Other service schedules can be arranged. If you would like to know more about service more or less than once a week, please call us. Our rates are based on weekly service to average sized yards. Surcharges may be added if the roaming area of the pet is over sized. We provide free written estimates – so you will know before you start service with us, what your rate will be – and, we offer discounts to our regular cleaning rates for rescue and shelter dogs, senior citizens, pregnant women, disabled individuals, active police, fire, military and EMS personnel. Scoops works year round in all types of weather including snow and rain. However, heavy rain may create a “muddy” situation and may stop us. We will make every effort to make up the work later that week. Snow or very cold weather can stop us. If it snows or if there is a considerable ice build up three days before your scheduled service day and there is still snow on the ground, we will return the next week or the next scheduled service day if you are a twice or three times a week client. It is very common to have waste that is frozen solid on the ground due to ice and it can create a larger mess trying to remove it. Under those circumstances, we may leave it until it has had and opportunity to melt enough to be able to remove it. There may be times that your gate is frozen and un-usable. We will do our best to open a frozen gate, but please understand we cannot be aggressive to the point of damaging your gate. Also, if you employ a plow service, please inform them to NOT plow your gate in which makes it impossible for us to access your yard. We do not dig out gates. If we are unable to access your yard, we will return the next week or the next scheduled service day if you are a twice or three times a week client. When there are situations beyond our control that do not permit us to service your yard, your monthly rate will remain the same. We do not credit under those circumstances due to twice the amount of waste on our next visit. Winter is a more time consuming season for us. Just about every aspect of our business costs rise during the winter months. This is a temporary situation each year. For this reason, we do not raise our rates during the winter months as many in our industry do. We do not work on the major holidays. When a holiday falls on a regular service day, we will advise you of the alternate day either by a note on your prior month’s invoice, email, phone or via door sticker on the week prior to the holiday. Service returns to the regular schedule the following week. Since Scoops staff are not allowed to climb or jump over fences, please make sure that we can gain access to your yard on your service day. You may provide us with a key or the combination to the lock if that is convenient for you. Can you work with my dog in the yard? We get along well with dogs; however, there are some cases when a dog will not let us into a yard. If you know your dog is not good with strangers, or it become apparent that your dog will not allow us to clean the yard, then we will ask that you restrain or confine your dog securely for our visit. We don’t want to take unnecessary risks with your dog or us. Scoops will mail a statement at the end of each month after work is completed. Payment is due upon receipt of the invoice. If payment is not received by the end of the month, a 10% late fee will be applied to all invoice (subtotal) payments received after the end of the month. Payment can be made by personal check (we enclose a preaddressed courtesy envelope for your convenience), or by visiting our website at www.scoopapoop.com and making a payment thru “PayPal” via the button on our site, or via credit card (credit card processing is available thru Paypal’s secure site). Or, as an added convenience, you can leave a credit card on file with us (Visa, Mastercard, Discover) – our system is encrypted and secure. You can also set us up as a “Payee” thru your online banking institution. No. We can start and stop your service over the phone. We do not require contracts, there is no minimum service period and there is only 24 hours notice required to cancel service. There may be. Substantial accumulations of waste will mean that an “initial” cleaning may be necessary. This first visit is a timed visit and is billed at $30 for the first 30 minutes with an additional $10 for each additional quarter hour. If it is necessary to send additional technicians, that fee is billed at $25 for the first 30 minutes and an additional $5 for each additional quarter hour per technician. The initial cleaning fee is charged only on the initial visit – subsequent visits will be billed at your quoted weekly rate as long as there is no interruption in your regular service interval. Number of technicians sent for the initial cleaning will be determined by the size of the property and length of time elapsed since the last cleaning. 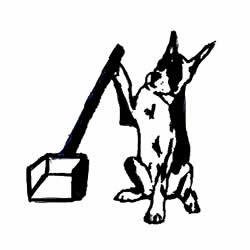 Average cleanups range between $45 – $85 depending on when the yard was last cleaned and the number of dogs that have been utilizing it. What does Scoops do with the waste? The waste is double bagged and tied, and placed in a spot or trash receptacle that you designate. In can then be placed in your regular weekly trash pick up. What is your dog out/lockout policy? Once Scoops staff arrives, they will make every effort to service your yard. If we are unable to clean your yard because the gate is locked or for any other reason, we will attempt to notify you of the obstacle so it can be remedied by the time of our next scheduled visit. We do bill at the usual rate for service calls where we cannot gain access to the yard. What do you mean by “Referral Rewards”? Anyone who refers Scoops to a friend or colleague, will receive two free service calls, once that new client pays their first full months statement balance or 4 cleanings. Sure ! One-time-only or short term service can be easily arranged. What are your community efforts? Scoops will offer *two free services to anyone who adopts a dog from the Humane Society or a local animal shelter or rescue (with proof). We also offer a 10% discount to assistance and police dogs. Scoops promises that you will get service you are happy with or you don’t have to pay for it ! We know our business depends on doing excellent work, and it’s that quality on which we stake our success. We strive to provide perfect service under **normal conditions, but if there is ever a time when you are not completely satisfied, please let us know immediately. We will make it right, either by coming back to re-scoop the yard the same or next day, or by crediting your account so you won’t be charged. **normal conditions are considered to be a lawn that is cut or mowed on a regular basis without large amounts of debris or leaves hiding any waste that may be underneath. We can only pick up what we can see. Please sign and date the SECOND copy of the estimate form attached to this document which indicates that you have read and understand our policies and mail it to us in the envelope provided.